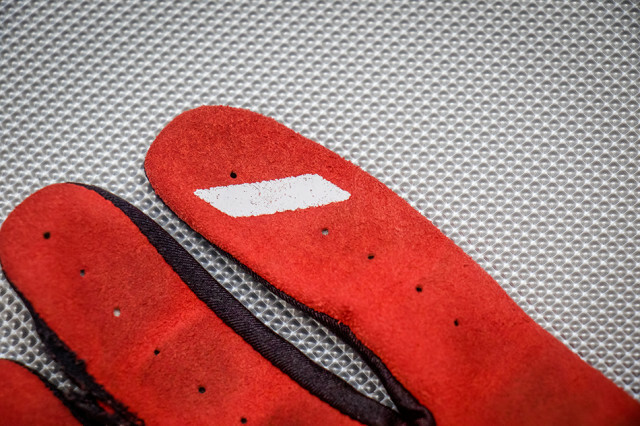 Unfortunately for glove manufacturers, their best work should go largely unnoticed. Riders have different preferences in glove style, protection needs, retention and overall fit. When it really comes down to it, my ideal glove has a few key qualities: no unruly seams to create distracting or irritating pressure points, a palm material that doesn't bunch-up, flexible finger and backhand material and of course the always subjective ‘comfortable’ fit. If one of those traits is absent, I notice my gloves a whole lot more than I care for. 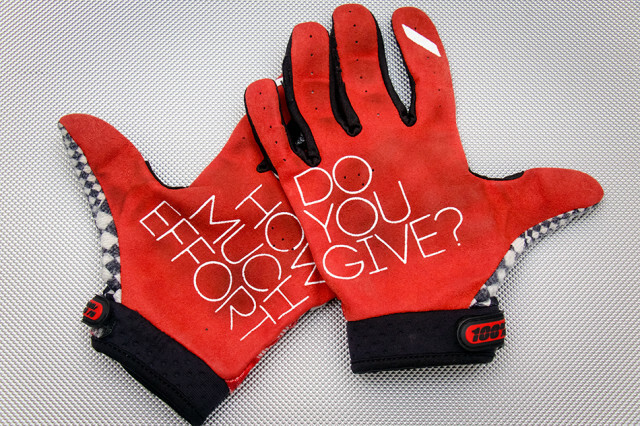 On paper, 100%’s Ridefit gloves appear to fall in line with all of the above. I've been wearing a size large version of the Spicoli-like, checker-print Legend colorway. First, let's look at the basic features of the Ridefits. The palm is made from single layer of a perforated Clarino material, while a 3-millimeter-thick overlay pads the thumb as it wraps around the grip. Airprene (breathable neoprene) cuffs and thumb panels, and the mesh backhand are all integrated for a precise fit and provide airflow where possible. The silicon palm graphics are intended to increase traction on the grip, and the integrated Tech-Thread keeps your Tinder-swiping thumb effective while waiting on lagging friends. Checkerboard not your style? The Ridefits are available in four other colorways. Sliding the Ridefits on for the first time, I noticed the lightweight and flexible backhand material. I find that the more flexible the backhand and fingers of a glove, the less my fingers and hand have to fight the material as I hold onto the grips, which means less hand and arm fatigue throughout a ride. Various brands have different ‘solutions’ or technologies designed to eliminate palm material from bunching. The Ridefits’ minimal palm is pretty standard on motocross and mountain bike gloves these days. After dozens of rides and laundry cycles, the palm remained supple, rarely felt bunched up and didn't show any signs of damage–even in the contact areas. Thankfully, the silicon palm graphics are minimal. When hands and gloves are dry, silicon can provide additional grip, but in wet or extremely hot conditions when palms are soaked with rain or sweat, I find silicon becomes slippery and ironically ends up being more of a hindrance than an asset. 100% says the Ridefit has its Tech-Thread material in the thumb to operate smartphone screens, but it doesn’t seem any more effective than a typical damp glove. Other than the wrist closure scuffing up the thumb material and the checker design fading slightly, the gloves have held up quite well. If you're like me, each time you look inside your riding gear drawer certain items jump out and conjure memories and reasons why each has or has not been worn in a while. With the Ridefit glove, I regularly grab them with the knowledge that they'll likely go completely unnoticed for the next few hours—just as expected. ‘Divine Simplicity’ is 100%'s tagline for the Ridefits, and at just under $28, the gloves live up to the claim.